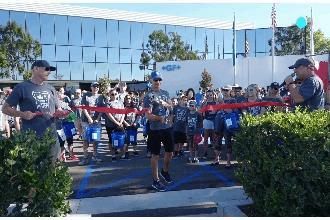 GF Piping Systems (GF) hosted a special “Walk for Water” charity event in Irvine, California on Oct. 22. More than 200 participants that included GF employees, their families, friends, and sponsors, took part in the event to raise awareness and funds for the drinking water shortage worldwide. 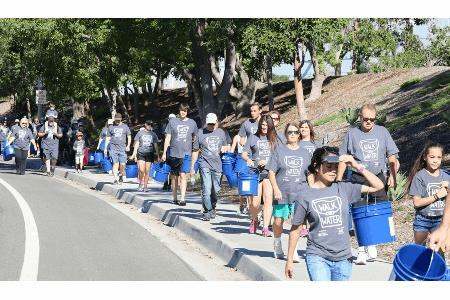 Participants symbolically carried buckets of water along a designated 3 ½ mile route – a daily routine for many women and children around the globe who live without the luxury of clean drinking water at home. Sponsorships and donations for the event, including $10,000.00 from GF Corporation, raised more than $40,000.00 in support of Water Mission, a charity organization and GF customer. Water Mission is building, installing and maintaining sustainable safe water and sanitation solutions for people and communities suffering under the global water crisis. The success of this first event far exceeded expectations. The initial goal for the “Walk for Water” event was to collect enough money for one water treatment system at a cost of $7,000.00. Raising of over $40,000.00 translates into providing safe water for life to more than 4,000 people. Since 2008, Water Mission has brought access to safe water to 3.2 million people worldwide. In many parts of the world, women and children spend 2-3 hours a day walking miles to collect water. Much of the time this water is not safe to drink. The charity walk started and finished at GF Piping Systems Americas Headquarters at 9271 Jeronoimo Rd., Irvine California. After the 3-1/2 mile walk, participants enjoyed a dunk tank, music, face painting, balloon animals, and a bounce house. Also included for each registered participant was a GF Walk for Water T-shirt, food, and tour of the GF facility. Water Mission uses GF pipes, fittings, and valves to put water distribution in place that directly shortens the distance people have to walk to access safe water. Contaminated water is one of the world’s largest killers. This staggering problem can be improved with access to safe water and sanitation. GF is extremely proud of the impact their products and partnership with Water Mission are making in the life of many people.